PORTLAND, OREGON (August 2018) – When life revolves around days on the water, eyewear versatility is critical. 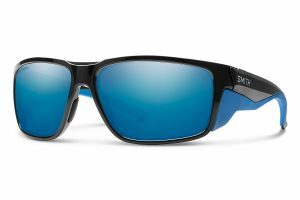 The new Freespool with MAG™ interchangeable technology, from Smith’s WATER Collection of performance eyewear, offers multiple wearability options in a single sunglass. The quick release system of Smith MAG™ technology offers two sets of interchangeable temples on the 8-base Freespool sunglass. The Everyday temples offer a casual, lifestyle inspired look constructed of a thin profile wrapped in comfortable, no-slip megol. When the fish are hitting hard, a simple click swaps them out for On-the-Water temples, engineered with additional side coverage to maximize light blockage and minimize distracting backside glare from bright sun. Smith MAG technology utilizes two opposing N52 neodymium magnets in the injection molded temple lug that intuitively separate to allow temple interchangeability and flexibility to adapt to changing environments with a locking mechanical engagement. Exclusively offered in proprietary ChromaPop™ Polarized lens technology, optically tuned for visual comfort and impact protection with enhanced glare reduction, while also offering anti-reflective, water and oil resistant coatings with 100% UV protection. The Freespool MAG™ (MSRP $249) is available August 2018 at specialty retailers and online at smithoptics.com. About Smith: Originating from Sun Valley, Idaho, Smith was founded in 1965 with the invention of the first snow goggle featuring a sealed thermal lens and breathable vent foam. With 50 years of innovation and design experience, Smith is widely known today as an industry leader that pioneers advanced eyewear and helmets that incorporate dynamic technologies, optimized performance and clean styling to fuel fun beyond walls. Smith seeks to power thrilling experiences in snow, surf, bike, fish and peak performance outdoor adventures with a comprehensive collection that exudes modern style and vibrant personality. To Smith, the experience is everything. Smith is part of Safilo Group. Additional information is available at smithoptics.com.